Even those who cook up amazing meals without batting an eyelid often feel intimidated at the first mention of dessert or traditional Indian mithai. This is because there is a misconception that desserts are complicated and that they require a large assortment of exotic ingredients, which are not normally available in our kitchens. This sounds terrible, but is fortunately not true. We agree, there are some amazing and complex desserts that require a lot of skill and several ingredients, but there are as many simple desserts that use common and few ingredients. 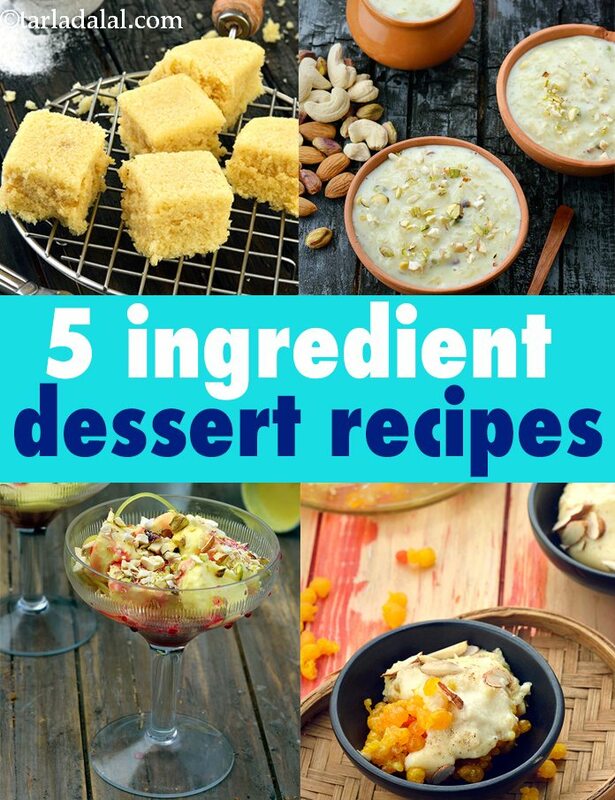 The purpose of this quick 5 ingredients eggless desserts is to introduce you to such wondrous dessert recipes, which require just five main ingredients! From melt-in-the-mouth Crepes Eggless Sweet Crepes for Desserts to luscious Quick Vanilla Ice-Cream, from super soft Eggless Vanilla Sponge Cake in A Microwave to richly-flavoured Chocolate Eggless Sweet Crepes, this mailer will show you that you can turn out amazing desserts without much ado. And all you need are easily available ingredients like refined flour, butter, vanilla essence, cocoa powder, etc. Not to forget some quick Indian dessets desi delights from different parts of our country, like the Churma Ladoo, Poha Phirni, Bengali Payesh and Makhane ki Kheer. Desserts like Baked Boondi with Rabri and Kesar Kulfi Falooda never fail to capture the diners’ fancy, and trust us, nobody will believe that you used just five main ingredients to make these! The best part is that you can try these any time – after all, who doesn’t have ingredients like besan, poha, ghee and sugar in their kitchen? When sweet potato abounds in the market, do not forget to try the awesome Shakarkand Ka Halwa, and when you yearn for a richer treat try out the Anjeer Halwa. This 5 Ingredients Desserts article is an eye-opener. It will prove to you that desserts are not so scary and elaborate. All you need is the right recipe, the intention to delight yourself and your guests, and a little bit of love to garnish the recipe with – then, your desserts are sure to succeed!